Wow - this is a big climb. 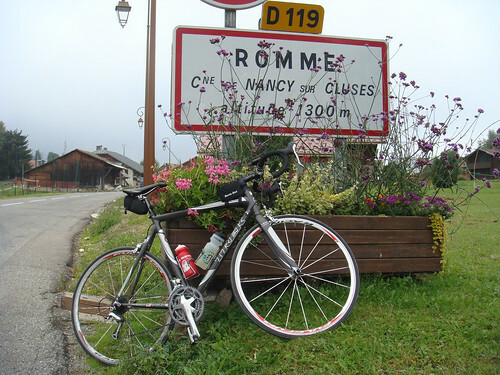 There is a little known, much harder, alternate north route up Col de la Colombière via Romme. Wow – this is a big climb. 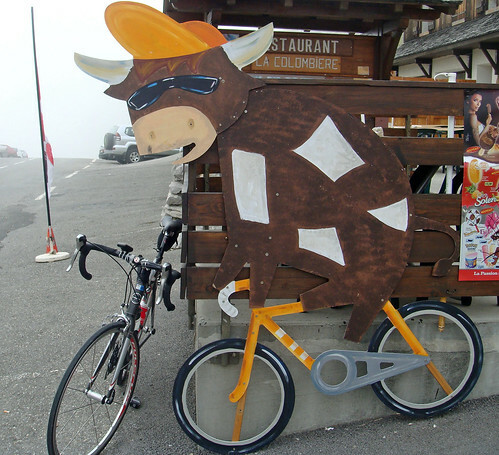 I had already climbed Colombiere three times this year in the Time-Megève and Grand Bo cyclosportives as well as my Tour de’Enfer – always from the classic north route. And my legs didn’t really want another crack at this tough ending. But there is also a little known, much harder, alternate north route via Romme. The best description of the route up to Romme is: relentless. It just goes up the side of a cliff and keeps going higher. This climb will appear in stage 17 of the 2009 Tour de France. Detailed stage preview here. From Romme the route descends down to Reposoir and joins the classic route for the rest of the climb to the Col.
Colombière has been in the Tour de France 18 times – I watched up top in 2007 – and is usually rated category one. But this way would certainly be Hors Categorie if you considered it one climb. It was cool, cloudy and foggy up top. So I didn’t bother with many photos. But on the way down I took a detour to visit the beautiful Chartreuse du Reposoir Monastery – founded in 1151 (!) by the Ordre des Chartreux. It’s labeled on the map below. On clear days there are great views of the Monastery complex from higher up the climb. Isn’t this a beautiful cliff road, at least at the start from Cluses as you leave the motorway down low? Relentless is the right description indeed. WELL DONE! You are a MONSTER… a climbing fool. I mean this, of course, in a very good way. You deserve your high carb recovery beverage now! La carte avec le profil est pas mal du tout ! Quant à cette route de Romme c’est vraiment celle qu’il faut emprunter, pour sa plus grande tranquillité, et pour le départ dans la falaise. Oui, Bikemap.net est aussi en francais. Tu peux faire une route facilement sans GPS. 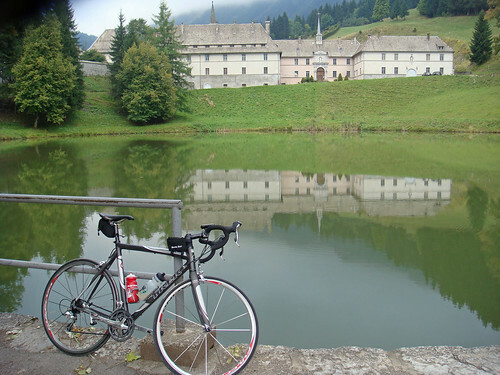 1540 m (1500m + detour au monastère). ERIC/BAST: You both have already climbed this? Well done!